If you are the parent of one of the millions of children with worry and anxiety: help is on the way. Anxiety is the number one mental health challenge facing our children today. Fortunately, there is good news for these kids and the parents who suffer along with them - anxiety disorders are also the most treatable mental health condition. With the powerful cognitive-behavioral treatments now available, there has never been more hope for anxious children's bright future. Treatment is not about trying to cajole or talk kids out of their fears; it's about teaching them to see worry as a problem to be solved. Translating cutting-edge techniques into down-to-earth, empathic, user-friendly steps, Freeing Your Child from Anxiety equips parents, teachers and therapists with the information they need to recognize the red flags of anxiety in children and how they can systematically overcome the obstacles that anxiety imposes. Empowering and insightful, Freeing Your Child from Anxiety, gives children - from preschool to high school - the action plan and the tools to take charge, unplug from anxiety, and plug into sound, realistic thinking. Learning the lessons from parents, children can reduce anxiety and even prevent anxiety disorders from taking hold. Part One includes a primer on causes and mechanisms of transmission of anxiety messages in the brain - the how, when and where of seeking help for your child - a chapter on the worry tricks the brain can play, and finally the five step 'Master Plan' for overcoming anxiety. Part Two goes in depth, with separate chapters for each anxiety subtype: panic, separation anxiety, social anxiety, generalized worry, phobias, trauma, and obsessive-compulsive symptoms. Also included is a chapter on habit behaviors and conditions which are typically exacerbated by stress, tics and trichotillomania. Part Three expands the focus to anxious children at school, and with friends and siblings. Because nighttime can be a very anxious time, a chapter on managing nighttime fears and sleep difficulties is included. Anxious children are especially sensitive to real life stress such as coping with illness, death, crime, and terrorism. Strategies for how to constructively discuss these difficult topics are included in a separate chapter. 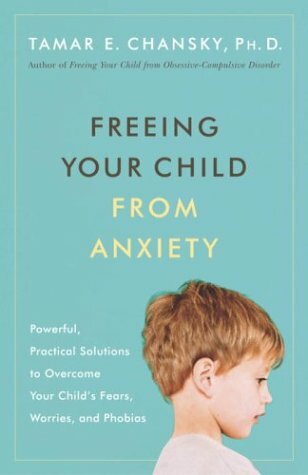 Any parent who has the unfortunate circumstance to pick-up this book and learn how to cope with their child's anxiety will find it very informative and helpful. More importantly it will help your family down the road towards freedom. Freedom for your child to understand their feelings of anxiety and begin to relax and enjoy their childhood experiences. Freedom is also attainable for the parents, and other siblings, to have more productive days without dealing with the amazing stress of altering daily actives to meet the needs of your anxious child. Dr. Chansky does a great job at explaining anxiety in simple terms that a parent can use to help explain to the child and re-assure him/her that the problem is not their fault. There are practical steps outlined that helps the child understand the differences between "good" thoughts and "anxious" thoughts. Dr. Chansky then breaks down different anxieties that are most common in children and provides exercises for the parents to break the anxieties down and build a foundation to change the child's thinking patterns that lead to the anxiety. While the book is laid out in a very easy to follow format, and devotes sections to your child's particular problems, I think the book should be combined with some professional help depending on the severity of your child's issues. It is a great tool to be used when working with your child to begin removing anxious thoughts, but as a non-professional I found certain exercise (although very helpful) opened the door to larger discussions that I was less prepared to help with. Freeing your child from anxiety.